Which Russian companies could benefit from sanctions? Investment in Russian stocks brings additional risk because of the sanctions imposed by the United States and European Union, according to research analysts at Morgan Stanley and Deutsche Bank. However, they say that the new sanctions against Russian state-owned companies will give private players on the Russian market – primarily participants on the consumer goods and IT markets - a chance to attract investors. According to research conducted by Morgan Stanley, the new sanctions against Russia came as an unpleasant surprise for international investors. Since the punitive economic measures were directed against major public Russian companies and banks which are largely integrated into global market, analysts suggest that investors will take a cautious stance. Among the reasons cited by the researchers in support of this thesis are uncertainty and the possibility of additional sanctions being imposed against Russia. According to Morgan Stanley, sanctions may affect not only the companies that fall into the sanctions lists, but also every player in these economic sectors. In turn, according to Deutsche Bank’s data, Russian financial and oil and gas companies may feel serious pressure in the short term, which will increase capital outflow and raise borrowing costs for Russian companies. How will new round of sanctions affect Russia? “Certain Russian companies have actually been subject to rigid external financing terms for the last several months, but because of the new sanctions, these restrictions will be legally binding,” the report said. “Companies with the closest ties to the Russian government are experiencing the most pressure, while there seems to be no occasion to sell shares in private companies. However, when Sberbank and Gazprom shares begin to fall, the overall market will also move downward, which will drag down the largest private companies in Russia,” said Anton Soroko, an analyst at investment holding Finam. According to macroeconomic analyst at UFS IC Vasily Ukharsky, there has been another drop in forecasts for the Russian market due to the third package of U.S. sanctions against Russia, the downing of the Malaysian Boeing airliner, and the growing conflict in southeast Ukraine. “Moreover, the EU may tighten sanctions against Russia in connection with the aforementioned events. In this regard, a negative external backdrop will unfold for the Russian market in the short- and medium-term,” Ukharsky said. Sanctions against companies affiliated with the government do open up new opportunities, especially for their private competitors. “If we talk about the sectors that are still attractive for investment despite the negative economic conditions and the deteriorating business climate, they are the consumer, telecom, and IT sectors,” said Investcafe analyst Timur Nigmatullin. 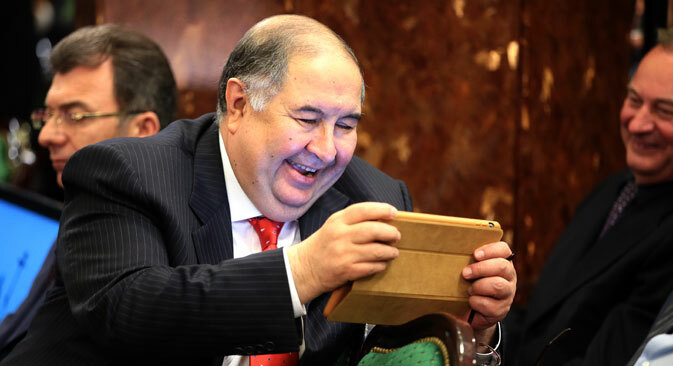 For example, he said that the companies most protected from sanctions are those such as the country’s largest food retailer Magnit, mobile operator MegaFon, which is controlled by Russia’s richest man Alisher Usmanov, and Yandex, the national search engine that has managed to beat Google on the Russian market. Deutsche Bank analysts cite several companies whose shares will also be able to offer a haven for investors in Russian stocks during a period of heightened geopolitical tensions. These include the oil companies Tatneft and Bashneft and metallurgical company Evraz. “In theory, it’s quite easy to avoid the consequences of the sanctions. You need to choose companies that are not on the sanctions lists and that are minimally connected with them,” Ukharsky advised. According to him, in this respect private companies look much more attractive than state-owned companies. However, the example of Novatek (the largest private gas company in Russia, which is included in the U.S. sanctions list) shows that there are no guarantees. However, as head of the analytical department at investment company Golden Hills-Capital AM, Natalya Samoilova, notes, sanctions produce no winners. Is Putin addressing Russia or the West? “If the sanctions are not lifted, it would mean a blow to the Russian economy, and under such circumstances it makes no sense for foreign investors to seek refuge in any other Russian assets,” the expert said. According to Samoilova, this case will most likely only increase capital outflow and lead to a more rapid transition to economic recession. On the other hand, if the restrictions on Russian companies were to be removed in the next six months, the victims of the sanctions will be the most promising players. First in line is the largest oil producing public company in the world, Rosneft.